Ten of us gathered at Brighton Station: Angela D, Chris, David, Graham, Jim, Nick, Prudence, Sikka, Tessa and Wendy. Tessa had the interesting experience of her bike getting stuck in the middle of the double gates leading to the platform whilst chatting to the railway guard. No way would it allow him to open them and the only way was to lift the bike clear. Lucky it wasn’t an electric bike! L-R Jim, Wendy, Prudence, David, Angela D, Sikka, Tessa, Chris, Graham. (Photo by Nick). 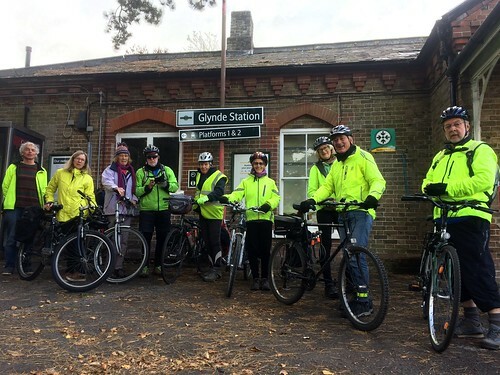 Setting off from Glynde we encountered our one and only ‘H…’ It was definitely more than an ‘Undulation’. 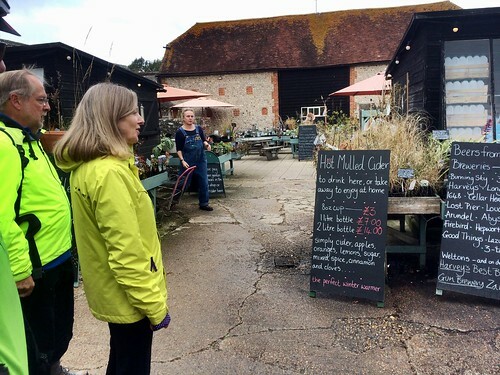 We quickly arrived at Middle farm, our coffee stop via country lanes and a spell on the bike friendly pavement alongside the A27. When coffee and second breakfasts had been consumed we set off on more country lanes fringed by cropped hedges and autumnal trees. After Ripe we headed for Laughton, stopping for a moment to count ginger cats in a farmyard. The skies were full off swirling wind-driven clouds with a hint of rain. 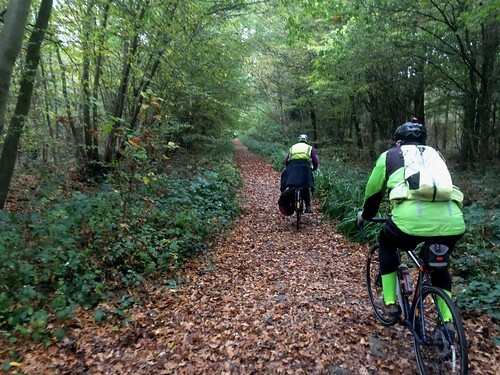 We crossed the A2124 to ride along a byway through Laughton Common Wood. It was well-timed. Rain had become heavier but we were protected by overhanging trees. By the time we reached Vert Wood where the track was wider and the trees less protective, the sun was out. Crossing the A22 we continued on country lanes to Chiddingly and our lunch stop, the Six Bells. Opinions of lunch were mixed, Angela being pleased she had eaten a hearty Cornish pasty at our coffee stop. It rained during lunch so many decided to don their waterproof trousers. 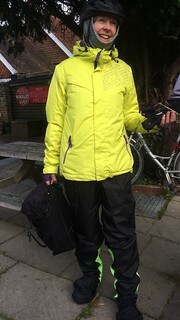 Ther e was much mirth at Wendy’s all-in-one waterproof trousers and overshoes which made her her look a clown about to enter a crime scene. We stopped in Muddles Green at Farley’s Farm House to see an exhibition of Lee Miller’s recently found archive photographs, really varied and interesting. The sun was low as we cycled the remaining miles to Berwick station along a mix of byways and lanes. Those really keen to catch the 15.55 train to Brighton raced ahead with directions from Graham. Others were delayed and did not get there in time. I believe they spent a convivial hour in the pub waiting for the next train? Thank you Graham for a voyage of discovery along those lanes and byways. Jim adds: Yes, we “lost” Nick and waited for him to catch up, but it turned out he was ahead of us! He could have caught the earlier train with Tessa et al., but gallantly waited for us to arrive before repairing to the pub. As we waited on the platform, we witnessed a lovely sunset. I’d like to thank Graham for finally introducing me to Farley’s, which I had heard of on an earlier ride but never managed to pinpoint. As well as Lee Miller they were also featuring an exhibition on space, time and relativity by Sir Roger Penrose, who is the cousin of Farley’s current owner, Antony Penrose, the son of Lee Miller. This was “right up my street” as I am currently studying the philosophy of relativity! Sadly, both exhibitions were closing that day, and we had little time to tarry. This entry was posted on Tuesday, October 30th, 2018 at 1:39 pm and is filed under Ride report. You can follow any responses to this entry through the RSS 2.0 feed. You can leave a response, or trackback from your own site.